Powers/Abilities: Sugar Man is a mutant with various superhuman powers. He can alter his own mass, shrinking to the size of a pebble or even smaller. If he loses mass, the lost mass is shunted to an unknown, possibly extradimensional space. He has an extremely durable, sharp abnormally large, prehensile tongue that he can charge with bio-energy. In combat, he mostly uses it to skewer his enemies. As part of his physical mutations, most of his body is comprised of an oversized head with two extra arms on his head that he also has control over. In combat, Sugar Man usually relies on hammers, axes and guns to strike and injure his opponents. He is also an exceptional hand-to-hand combatant. His senses are enhanced, he can sniff out people based on the food they had. Despite his gruff, unsophisticated way of speaking, the ruthless and sadistic Sugar Man is a genius level geneticist. 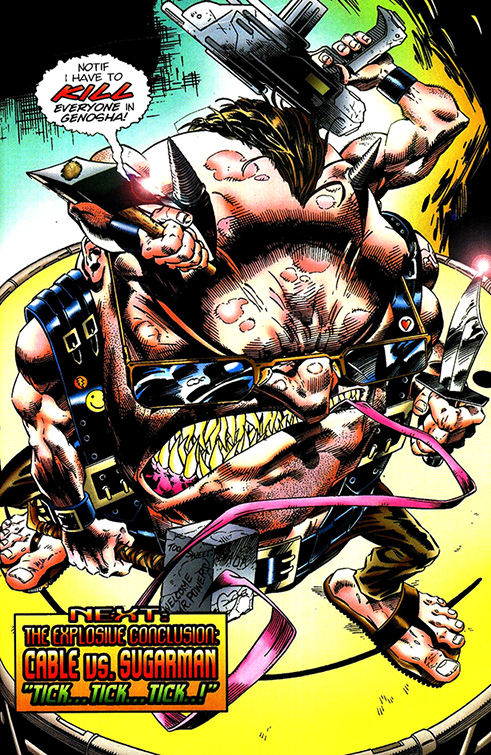 (Generation Next I#2 (fb) - BTS) - On Earth-295, the Sugar Man was a feared and powerful mutant who rose up through the ranks of Apocalypse's organization. He was put in charge of various work camps on the Eastern seaboard, including the pens where humans and mutant dissidents were being kept, as well as the Seattle Core, a giant power plant that served as the empire's main source of energy. He ruled over these facilities with an iron fist, feared by both his underlings as well as the prison population. (Blink I#3 (fb) ) - Sugar-Man would often visit the pens to satisfy his disgusting appetites. Often, he would choose the young mutant Clarice Ferguson who was kept there along with her best friend Illyana Rasputin. (Generation Next I#2 (fb) - BTS) - Eventually, Illyana was transferred to the Core where she used her earlier experiences with Sugar Man in the pens to avoid him. Sugar Man would frequently scour the Core looking for his next plaything, using his enhanced senses to sniff out targets by the food they ate. (Generation Next I#2 (fb) - BTS) - Sugar Man hired most of the higher ups at the Core himself, including head of security Quietus. (Generation Next I#2) - On a routine visit to the Core, the Sugar Man sniffed out one of the workers to have his way with. (Generation Next I#2 - BTS) - Unbeknownst to the Sugar Man, Generation Next, a group of Magneto's youngest recruits and their teachers Colossus and Shadowcat were assigned to infiltrate the Core and retrieve Illyana Rasputin. Thanks to the prophecies of the mutant madman Bishop, Magneto had become convinced this world was not to be. He needed Illyana's latent time travel powers to set matters right. Generation Next members Husk and Vincente killed chief warden Quietus then entered his office to search his files for any info on Illyana. Afterward they began posing as Quietus. (Generation Next I#2 - BTS) - The Sugar Man received word from Shadow King that an unknown party had been psi-surfing Apocalypse's data files (the young mutant cyberpath Know-It-All). According to Apocalypse, this was a prelude to a break-in, which Sugar Man was told to prevent at any cost. In order to do so, he traveled to all the sites under his command. (Generation Next I#3) - At the Core, Sugar Man went to see Quietus, gruffly ignoring the man's secretary Hag. He found "him" in the shower (the soap was masking his different scent). 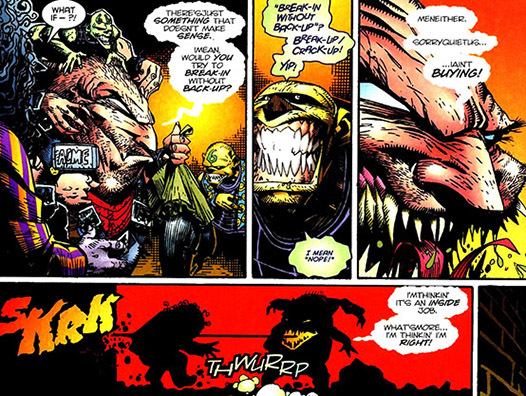 Sugar Man initially fell for the distraction, telling about Shadow King's warning and ordering "Quietus" to humor Apocalypse by sniffing around, even though he found the idea of someone breaking into the Core preposterously funny. Some time later, he ran into "Quietus" just as he was meeting with fellow Generation Next members Skin and Chamber. Immediately recognizing them as mutant traitors (only humans were allowed to work at the Core), Sugar Man commended "Quietus" for his diligence and gave him the honor to kill the intruders. Sugar Man got suspicious when "Quietus" planned to shoot them, wondering why he didn't use his mutant powers. "Quietus" claimed he didn't want to waste the energy on them, opting for his gun instead. Sugar Man then ordered him to kill Chamber, which he did. (Generation Next I#4 - BTS) - Chamber used his psi-plasma to simulate the effects of the gun shot. (Generation Next I#4) - Sugar Man, already suspecting "Quietus" wasn't himself, claimed he wasn't satisfied with just one dead mutant. To prove his point, Sugar Man used his razor sharp tongue to stab "Quietus" through the chest, only to be stunned when Vincente began leaking out of the rapidly deflating form. Sugar Man waited around long enough for Husk to reveal her true form before ordering his troops to attack and kill the mutant teens. Before that could happen, the arrival of Shadowcat and Colossus distracted his forces long enough for him to be blasted apart by Chamber. Though he appeared dead, the Sugar Man actually shrunk down and, upon hearing they had come to find Illyana, went out looking for her. He eventually tracked her down inside Generation Next member Mondo who was on his way out with Chamber and Skin by the time Sugar Man caught up with them. Using his tiny form to get close to them, Sugar Man enlarged himself, killing Mondo instantly by stabbing him through the heart with his tongue. He grabbed Illyana and threatened to eat her alive if that would mess up Magneto's plans. He was stopped by a furious Colossus who stomped on the villain, bashing him into a fine pulp and once again seemingly killing him. Instead, Sugar Man shrunk down to the size of the tiniest of pebbles and hid inside the straps of one of Colossus' oversized boots. (X-Men: Omega#1) - The Sugar Man remained inside Colossus' boot for most of the final battle between Magneto's X-Men and the forces of Apocalypse. When he spotted the M'Kraan Crystal, he immediately sniffed out the possibilities. Leaving his cover undetected, the shrunken down sadist made his way to the crystal and hopped in. (X-Men II#48 (fb) - BTS) - Due to the enigmatic transtemporal dimensional qualities of the M'Kraan Crystal, Sugar Man ended up on Earth-616, albeit 20 years in the past. His unexpected trip through time and space had left him severely disoriented for an unrevealed period of time. His confusion slowly cleared up after a chance encounter with Earth-295's Hank McCoy, another higher up in Apocalypse's organization. Though there was no love lost between them, the two decided on a deal to share any information that might be beneficial to the both of them, especially any data on this world's Mister Sinister whose Earth-295 counterpart they deeply feared. Over the years, their work (based off of Earth-295's Sinister) was noted by the 616-version, who was mystified by it. (Cable II#28 (fb) - BTS) - Sugar Man eventually made his way to Genosha. Sensing the island nation had the right political climate to recreate a way of life he was used to back in his native dimension, he sought out the struggling, patriotic geneticist David Moreau. Tempting him with secrets he himself stole from Earth-295's Mr. Sinister, the Sugar Man helped the eager Moreau develop and perfect the genetic bonding process that turned mutants into mindless mutate slaves ready to labor for their country. Sugar Man was set up with a hidden lab in Genosha's Ridgeback mountains. Equipped with a nuclear power core and a mutate processing plant of itself, Sugar Man was the power behind the throne for years while Moreau, now known as the Genegineer, became a celebrated figure. Over the years, Sugar Man got to know Moreau's young son Philip and even took a liking to him. Sugar Man amused himself by experimenting with mutates, creating and maintaining a fighting force of mutates should he ever be discovered. (X-Men Prime#1 (fb) - BTS) - One of Sugar Man's first successfully created mutates, branded with a 01 on his forehead, was originally a middle-aged mutant called Edgerton. (Excalibur I#87 (fb) - BTS) - A standard addition to each of the mutates created by the Sugar Man's bonding process was a dissolution implant that allowed him to terminate them via remote control. (X-Man I#6 (fb) - BTS) - Sugar Man attempted to imitate Earth-295's command structure, insisting his underlings called him prelate. One of his most promising followers was a man called Rex who proved himself to be a ruthless assassin (see comments). (X-Men Prime#1 (fb) - BTS) - Sugar Man mostly kept to himself as the decades passed, but he continued to monitor everything that went on in and around Genosha. (X-Men Prime#1) - Sugar Man watched from his lair how Excalibur, in Genosha to assist the government, sought out the aid of Mutate 01. He was about to show them the Genegineer's notes that proved David Moreau wasn't solely responsible for coming up with the mutate bonding. Not ready to have himself revealed, he activated "Oldie's" dissolution implant, causing Edgerton to spontaneously self-combust, destroying Moreau's research notes in the process. (Excalibur I#87) - Sugar Man continued to monitor Excalibur's movements on Genosha. He saw himself forced to intervene when Douglock successfully accessed Philip Moreau's personal computer logs. Right before the cybernetic Excalibur member could find out who Moreau was working with, Sugar Man remote detonated the PC, thereby keeping his secret for another day. (X-Man I#6) - Learning about the arrival of the vastly powerful Earth-295 native psionic Nate Grey, the Sugar Man sent his personal assassin Rex out to capture him. Rex tracked Nate down to Montreux, Switzerland. There he confronted and fought against Nate and his new associate Madelyne Pryor who together managed to beat him back. After retreating, Rex contacted Sugar Man and assured him he had everything under control. (X-Man I#7) - Sugar Man was furious when Rex remained incommunicado for an extended period of time. 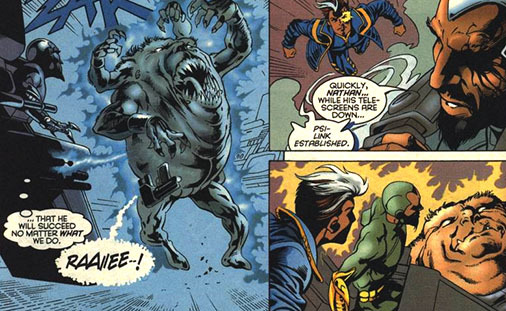 Eager to get Nate Grey and Rex, he strangled one of his terrified mutates with his tongue out of frustration. A little while later, he was contacted by Rex who had followed Nate and Madelyne to Paris. Before Rex could give Sugar Man a status update, he was taken out by Selene who told Sugar Man she wished this to remain a private matter before breaking the connection. Sugar Man was left to simmer, stew and worry. (X-Men II#48) - Sugar Man decided to pay Dark Beast a personal visit when he began to notice his reluctant ally was holding out on information regarding the recent arrivals from their native reality. After quickly dispensing with Beast's guards, he confronted the master geneticist himself just as he was studying video footage of the X-Man Bishop. 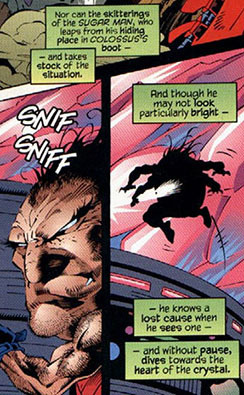 Following a brief struggle, the two villains composed themselves and Sugar Man listened to McCoy's explanations about Bishop's unique transtemporal role and involvement in the apparent destruction of Earth-295. They decided Bishop had to be eliminated before any of his fellow X-Men could pick his brain and learn about their world and their presence here. They were also worried this reality's version of Mr. Sinister would find them. While they were discussing strategies, Dark Beast showed Sugar Man his latest advances in genetic engineering, among them a lifeform that was mostly brain tissue that filtered every thought of his other creations and translated them into digital resource data. Sugar Man called him a showoff and then agreed to have Dark Beast's personal assassin Fatale deal with Bishop. (X-Men II#49) - Sugar Man returned to his hidden lair where he monitored Fatale's progress. 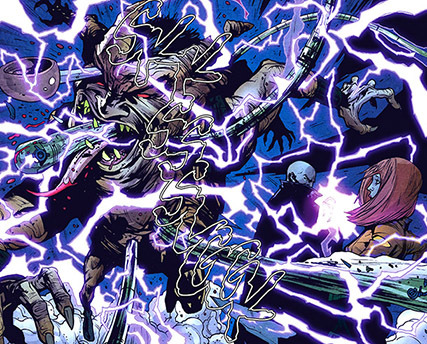 Just as he was telling Dark Beast he was most pleased their alliance had paid off, the evil geneticist made a stunning discovery (he saw his 616 version) and hung up on his outraged ally. (Cable II#28 (fb) - BTS) - Genosha's mutate bonding process caught the attention of Mr. Sinister who couldn't help notice the similarities between the Genegineer and his own work, though he remained unaware of the Sugar Man's involvement. (Cable II#26 (fb) - BTS) - Hoping to learn the true origins of the mutate process, Mr. Sinister went to Genosha under the guise of Essex. Acting as an informant to freedom fighter Jennifer Ransom and Philip Moreau, he manipulated events that brought Cable and Domino to the island as well. (Cable II#26) - Cable's presence on Genosha was picked up by the Sugar Man who mistook him for his Earth-295 counterpart and incorrectly figured X-Man had come after him following their recent altercation. He made arrangements for the Press Gang to attack and kill "X-Man" and his associates. (Cable II#27) - Cable and his allies defeated the Press Gang. Then, using his telepathy, Cable forced the teleporter Pipeline to transport them to the coordinates Philip Moreau got from the mysterious Essex. He complied and brought them to the edge of Sugar Man's Ridgeback Mountain headquarters. Sensing their approach, the Sugar Man realized his secret was about to be exposed. He was not going to let that happen, not even if everyone on Genosha had to die. He girded himself for total war. (Cable II#28) - Sugar Man sicked his private battalion of mutates on Cable and the others, even getting involved himself in the fight, pleasantly surprised to find "X-Man" was actually an older version of the Nate Grey he knew. When Cable tried to stop him telepathically, he was overwhelmed by the transtemporal jumble that still existed within Sugar Man's mind. Aware he was fighting a losing battle and eager to cover his tracks, the Sugar Man initiated meltdown procedures for the nuclear core powering his base. Using the confusion and fear, he tried to escape only to be opposed by Philip Moreau. Stunning him with stories of how he and his father created the mutate bonding process, Sugar Man decided to abduct Philip. They teleported out of sight. (Cable II#28 - BTS) - Cable successfully prevented the meltdown by guessing the Sugar Man's override code, the simple and almost childlike "78437 (S-U-G-A-R)". (X-Man I#16 (fb) - BTS) - In his dreams, Nate Grey would often see the shard of the M'Kraan Crystal that he inadvertently used to travel to Earth-616 along with Holocaust. The gem's multifaceted exterior always showed him scenes and people native to Earth-295, like the Sugar Man jumping into M'Kraan. (X-Man I#19 - BTS) - Sugar Man was among the memories Nate Grey gave psionic form and substance during his confrontation with Mr. Sinister. (X-Man Annual '96 (fb) - BTS) - Sugar Man returned to Genosha where he rebuilt his lab facilities with help from the remaining Magistrates who also began to guard him. Still, the villain tired of this Earth and longed to return to Earth-295. To do so, he built a fargate, powered by the residual M'Kraan energies still in his system to locate the proper reality. However, he planned to return to the past, to the eve of the third stage of Apocalypse's North American ascendance which was marked by the Plague of Penitence. He figured that by returning with an even deadlier version of that plague, one only he had the antidote to, he could usurp Apocalypse and rule in his place. However, the mutates he had produced to power the gate were incapable of opening a portal, only generating brief flashes of that alternate Earth. (X-Man Annual '96 - BTS) - X-Man was caught in one of those flashes while flying over the Atlantic. Shocked to find himself briefly back on his old world, he tracked the energy signature back to Sugar Man. (X-Man Annual '96) - Fighting Genoshan Magistrates as he entered Sugar Man's lab, Nate Grey was ill prepared for the fact the fargate was programmed to automatically drain his power when he was near. The gate activated and Sugar Man went through, with Nate following moments later. (X-Man Annual '96 - BTS) - Sugar Man arrived in Earth-295's past and went to put his plan in motion. Moving to Niagara Falls and quickly building a lab there, he made preparations to poison the water supply with his new virus. 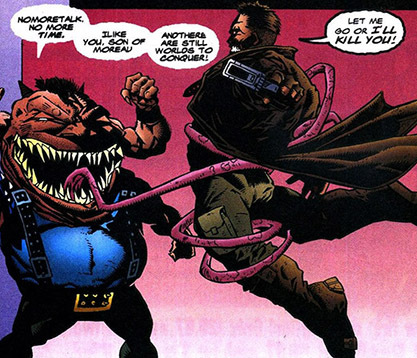 Before he could unleash it, he decided to do some more testing and captured both mutants and humans, among them the Mimic (Calvin Rankin) and the illusion caster Jason Wyngarde. Sugar Man's actions drew the attention of Wyngarde's friends Forge, Magneto (Max Eisenhardt) and Morph (Kevin Sydney). When X-Man appeared on Earth-295 weeks later, he allied himself with them. (X-Man Annual '96) - Sugar Man was experimenting with the virus on Wyngarde when X-Man and the others attacked his lab. Ordering his men to defend him, Sugar Man managed to unleash the virus before Forge knocked him out with an electric charge from his tech-chair. X-Man telepathically learned what Sugar Man had done and, through a massive telekinetic feat, filtered the toxins from the waters. Magneto contained it in metal and dispensed with it in the upper atmosphere where the cold kill the virus. It was then agreed by Forge and Magneto that both X-Man and Sugar Man should return to Earth-616, since they felt Earth-295 was a dead reality destined to die out. Though reluctant, X-Man agreed and powered the gate again. (X-Man Annual '97 (fb) - BTS) - The fact that Sugar Man, Nate Grey, Holocaust and Dark Beast all came from Earth-295 to Earth-616 using the M'Kraan Crystal's dimensional properties turned them into living, breathing drains of the crystal's unique energies. Eventually, the Shi'ar took notice of this effect. Warned by the crystal's guardian Jahf, Lilandra sent troops to Earth to deal with the disturbance, led by commander Kai'tra. As luck would have it, they first homed in on the Sugar Man who used his charms to convince the Shi'ar to spare him. He allowed them to drain his crystal energies, in return he'd lead them to the other three who he held no particular love for, especially after losing control of Genosha and being treated like a joke. Designing weapons to help the Shi'ar easily capture Holocaust, X-Man and Dark Beast, Sugar Man waited for them aboard the Shi'ar cruiser. (X-Man Annual '97) - Gloating, Sugar Man revealed his involvement in the capture of his Earth-295 compatriots. However, X-Man telepathically connected them in thought and Sugar Man bought Holocaust's promise to make him a horseman if he helped to free them. Sugar Man complied and turned against the Shi'ar, freeing the other mutants. Even though Dark Beast in no uncertain terms told him he was aware of Sugar Man's role in the Shi'ar capturing them, he led them towards the exit that was only accessible with Nate Grey's powers. When X-Man's telekinesis powered the gateway, Sugar Man returned to Earth, leaving the others to deal with the Shi'ar. (Excalibur III#9 (fb) - BTS) - Sugar Man returned to Genosha and remained in hiding, even surviving the Cassandra Nova orchestrated Sentinel massacre of the island's mutant population. After the destruction, he kept to himself content to wait in his bunker, stashed with food and supplies. (Excalibur III#10 (fb) - BTS) - Sugar Man also used his free time and genetics knowledge to cook up several mutated guards reminiscent of the ones he employed while he was running the Seattle Core on Earth-295. He kept one of them, a two-headed mutate called Rastus, close by at all times. (Excalibur III#9) - When the Dark Beast and a group of Magistrates discovered the entry hatch to Sugar Man's underground lair, they were foolish enough to enter it. Within moments, the Sugar Man struck at them from the shadows, massacring the Magistrates. Hearing his comrades die, McCoy recognized the Sugar Man's laugh over their screams. He managed to escape the lair, and though he was gravely injured Dark Beast reached Xavier's allies before he fell unconscious. (Excalibur III#10) - Acting on Dark Beast's warnings there was a danger in the catacombs, Callisto took Wicked to check it out. The veteran told the rookie to use her ghost forms to search the grounds, even though whatever hurt her ghosts would hurt her as well. Wicked sent one of her spirit forms in, discovering the corpses of the Magistrates that had accompanied Dark Beast. Unaware of the Sugar Man's presence, the spirit was torn apart by his razor sharp claws, causing Wicked so much pain she passed out. This convinced Callisto she needed to take an active hand and brought Omega Sentinel (Karima Shapandar) with her to investigate matters. Sugar Man managed to surprise them, using his tongue to stab and disable Shapanadar while briefly explaining his origins to Callisto. He then had Rastus deal with her. That fight ended with the guard chomping off half her tendril arms, but Callisto also severed part of the Sugar Man's tongue. By that time, Karima had recovered enough to take down Rastus, even laughing as Sugar Man tried to stab her again with the stump that was his tongue. With his defenses down, Callisto beat the villain with a pipe until he passed out. She and Karima then raided his stash for all the food and medical supplies they needed. 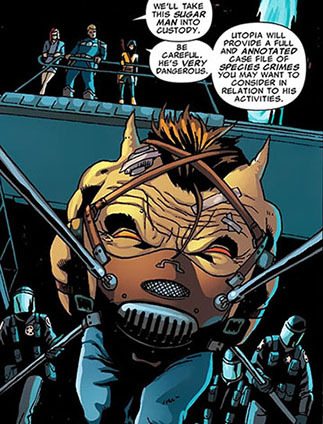 (Dark Reign Files#1) - Acting on orders from Norman Osborn, the living computer Quasimodo analyzed a wide variety of villains, compiling files on their possible uses in Osborn's new organization HAMMER. After going over Sugar Man's file, the cybernetic creature concluded that despite his genetic skills, he was an untrustworthy ally and extremely expendable. (Dark Reign Files#1 (fb) - BTS) - Most likely based on Quasimodo's recommendations, HAMMER troops located and captured Sugar Man. They imprisoned him in a HAMMER research facility where Osborn also had Earth-295's Nate Grey strapped and fused to a device called the Omega Machine which used his mutant powers to warp reality and generate dimensional portals. (New Mutants III#27 (fb) - BTS) - After Norman Osborn and HAMMER were defeated, Sugar Man managed to escape from his cell. Finding himself alone in the deserted facility, he discovered Nate Grey still stuck inside the Omega Machine. The quick thinking geneticist came up with a plan to use Grey and the machine to his benefit. To conceal his presence, he adjusted the machine's settings so it projected a cloaking field. Sugar Man, desperate to return home, then had the machine scan for alternate realities, hoping to find Earth-295. Figuring he needed help, he recruited a group of young bums and vagrants. By using a mix of genetic science and technology, he gave them all superpowers. Calling these loyal followers his New Mutates, he had them guard the facility and discreetly others who he would entice to enter the portals to check out the often lethal dimensions found by Grey. (X-Men II#200) - Hoping to find a way to undo the effects of the Scarlet Witch's reality altering spell that caused most of Earth's mutants to lose their powers, Beast (Hank McCoy) sought out the assistance of several villainous geniuses. Among them was the Sugar Man who Beast managed to contact through a video-link. (Uncanny X-Men I#488) - When he heard he wasn't going to be paid for his help, the Sugar Man refused to aid McCoy any further. (X-Factor III#23 - BTS) - Reporting his findings to Forge, Beast noted that alternate reality mutants like Sugar Man and Rachel Grey had all retained their powers on M-Day, speculating that their extradimensional origins might have protected them from the effects of the Scarlet Witch's realitywarp. (Heroic Age: X-Men#1) - As the new head of SHIELD, Steve Rogers analyzed the X-Men, their allies and enemies. Based on the available intelligence and his recent refusal to aid Beast in saving mutantkind, Rogers labeled the Sugar Man a greedy abomination and advised to be on the lookout for him. (New Mutants III#25) - Even though Nate Grey was already helpless and drained powering the Omega Machine, Sugar Man still made it a point to torture him with lifelike hallucinations that started out almost idyllic but would invariable turn into nightmares. (New Mutants III#25 - BTS) - Impressed by Dani Moonstar and her fellow New Mutants, Cyclops decided the team would be ideally suited to investigate and tie up any of the X-Men's various unsolved cases before they could come back to haunt them. He first sent them to find Nate Grey. (New Mutants III#26 - BTS) - Their search took the New Mutants to the HAMMER facility where the last reported sighting of Nate Grey was (he was still there, but undetectable thanks to the Omega Machine's cloaking field). (New Mutants III#26) - Around the same time, Sugar Man was introduced to depowered mutant Ronny who had come to him after hearing stories of the Sugar Man granting powers to others. Sugar Man could smell Ronny was afraid of him, but that didn't bother him in the slightest. He went on to explain what the powers he offered entailed: they were artificial boosts, a combination of technology and a radical reworking of the mutate bonding process. Ronny agreed to cooperate and was granted the power of corrosive spit. Now, the Sugar Man demanded he helped him by exploring a recently discovered dimension. Ignoring Nate Grey's rambled words of warning, Ronny entered the portal to a new dimension only to be quickly consumed by the local wildlife. Sugar's only disappointment was the fact Ronny's death meant they had to recruit yet another scout. Moments later, the New Mutants burst into his section of the facility (they had seen through the reality warp thanks to Cypher's powers). Though they were surprised to see the Sugar Man, he didn't care who they were and only wanted them dead. (New Mutants III#27) - Recalling a recent briefing on Sugar Man's powers and abilities, Danielle Moonstar engaged the villain on her own while the New Mutants took care of the New Mutates. She managed to hold her own against the imposing villain, using her arrows to stab, hurt and enrage him. At the same time, Cypher and Warlock got through to Nate Grey who for the first time in months was able to clear his head. Sensing that all the Sugar Man really wanted was to return home, Grey actively used his powers in concert with the Omega Machine to open the portal to Earth-295. Immediately smelling the familiar air of his home dimension, Sugar Man leapt towards the portal with Dani in hot pursuit. She followed him through, determined to stop him. Ignoring his pleading that he just wanted to go away, Dani managed to stab Sugar's tongue with one of her arrows, which slowed him down long enough for Sunspot to get a shot in back on Earth-616. She then dragged the unconscious Sugar Man back through the portal before delivering him into SHIELD custody. (New Mutants III#32 - BTS) - The goddess of death Hela used Nate Grey's memories of Sugar Man and the horrors he experienced on Earth-295 to stun, shock and horrify the seemingly omnipotent ancient Asgardian entities known as the Draumar. (New Mutants III#27 (fb - BTS) - Escaping SHIELD custody, the Sugar Man somehow managed to find a way to return to his home dimension. (Age of Apocalypse I#1 (fb) ) - On Earth-295, the Sugar Man helped to free his old ally Dark Beast (who had also recently returned to his native dimension). Together they set up a lab and began work on a new project. Their hidden facility was discovered by reporter Harper Simmons. Not eager to be discovered, they placed explosive charges in the lab and escaped through a teleportation portal. Simmons managed to escape as well and eventually contacted the X-Terminated, informing them of what he'd found. (Age of Apocalypse I#2 (fb) ) - Joining up with Weapon Omega, the scientific duo began work on cloning a number of deceased alpha mutants, giving them new life through the siphoned off power of the Celestial lifeseed Omega had recently captured. Eager to begin the task, they started the process of resurrecting prelate Scott Summers, while also focusing on restoring several of their old enemies, the X-Men: Banshee (Sean Cassidy), Shadowcat (Kitty Pryde) and others. (Age of Apocalypse I#1) - When the X-Terminated went to check out the remains of the lab, they were stunned to find it was now a massive laboratory where dozens of scientists were working. What's more, they were greeted by prelate Scott Summers, an alpha mutant who was supposed to be deceased. (Age of Apocalypse I#2 - BTS) - After fighting their way out of the lab, stunned to find Cyclops there, the X-Terminated fled. One of them managed to infiltrate the facility and hacked the data network. In doing so, the Human Resistance (led by Bolivar Trask) and the X-Terminated learned of Beast and Sugar Man's cloning program. Trask requested the help of the recently depowered Jean Grey and Sabretooth to put a stop to it. (Age of Apocalypse I#3) - Sugar Man and Dark Beast were bantering about in their lab while putting the final touches on the resurrection process of Alex Summers. Beast wanted to be doubly sure everything was in order before proceeding because they didn't have too much Celestial life energy left to make any mistakes. Sugar Man, in his own colorful vernacular, assured his colleague everything would work fine because "our mister Alex Summers here is a fluffy soufflé with a vanilla custard sauce drizzled on top." Alex Summers was brought back to life, just as his brother Scott arrived at the Alpha Lab to deliver more Celestial energy. 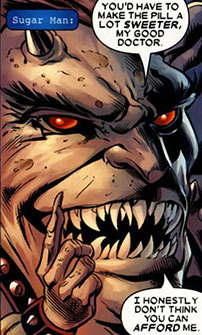 Summers was displeased to see his orders not to resurrect Alex were ignored, but nevertheless promoted him on the spot as Weapon Omega's new minister of war. Sugar Man helped Havok get acclimatised to his new existence by telling him he owned a mansion and yacht before returning to revive others like Emplate and Abyss. Hungry as ever, Emplate began scouring for a food source, eventually locating X-Terminated member Fiend (Francesca Trask) who had infiltrated the lab and successfully disabled the pod containing Abyss. Meanwhile, the other X-Terminated were attacking the facility head on. (Age of Apocalypse I#4) - Emplate left Fiend alive, handing her over to Dark Beast and Sugar Man, who were rather upset with the "human cockroach" for costing them Abyss. Right before Fiend was killed and tossed in the gene vats for recycling, Beast's guards told them they had captured her teammates Horror Show and Prophet who claimed they had Weapon Omega's wife Jean Grey in custody (Grey was still kept at Humanity's Last Stand). Intrigued, Beast and Sugar Man went to meet with them, dragging the unconscious Fiend along. Much to their dismay, Prophet revealed there was a tiny nuke hidden in his chestplate that would detonate the Celestial life energy and destroy the entire cloning facility. To cause even more chaos, Goodnight (Donald Pierce) had tricked the Incredible Thing (Bruce Banner) to attack the facility. Amidst the chaos, Sugar Man attempted to escape with Fiend but he was stopped by one of Horror Show's electrical charges. Taking Sugar Man captive, they left the facility even as it was going up. (Age of Apocalypse I#6) - The X-Terminated and Humanity's Last Stand struck a deal with the vastly powerful mutant Penance (Monet St. Croix). In return for her help in overthrowing Weapon Omega, they would give her custody of the Sugar Man who she planned to make her head scientist. Penance assured "this wayward son" he would be reformed and that his science would be of great use in the coming reformation. 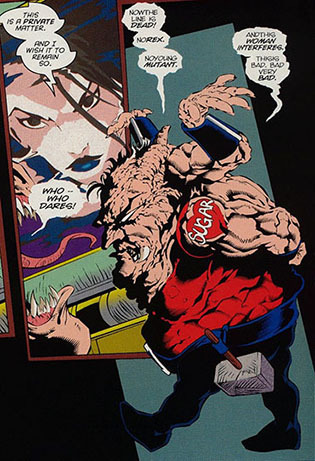 (Age of Apocalypse I#9) - The newly reformed, but no less demented, Sugar Man was having difficulties devising a way to take down Weapon Omega, much to Penance's frustration, even calling him a disgusting egg. Taking umbrage, Sugar Man insisted he should at least be a chocolate egg. Then, Prophet (William Stryker) showed up to break their impasse. He brought them the brain of Victor von Doom, convinced that it contained a way to separate Omega from the Celestial power he was fused with. Intrigued, Sugar Man went to work while Prophet explained his motives to Penance: if they gave him a weapon to take out Weapon Omega that the X-Terminated would use, both parties would be rid of a mutual enemy and if it failed, Penance would not be blamed for attempted murder. (Age of Apocalypse I#10) - Successfully accessing Victor von Doom's mind and recovering residual traces of Celestial Death Seed energy lodged in there, the Sugar Man came up with a way to kill Weapon Omega. Creating a tiny pellet he called the "jellybean/death bean/cosmic legume and the unholy pea", he explained to the stunned X-Terminated how upon ingestion the pill-sized projectile would separate man from god. Penance and Sugar Man planned to wait out how the X-Terminated would fare against Weapon Omega from a safe, distant location. (Age of Apocalypse I#13) - After the fall of Weapon Omega, Sugar Man assisted the newly formed leadership in any way he could. They planned against potential usurpers, but found no one was eager to challenge Penance's rule. (Magneto III#19 (fb) - BTS) - For unknown reasons, the Sugar Man decided to return to Earth-616, setting up another underground lab and mostly keeping to himself. He began puttering away at mobile power amplifiers in his spare time (see comments). (Magneto III#19 - BTS) - Hoping to find a way to quickly enhance and boost his failing mutant powers, Magneto had his associate Briar Raleigh set up a meeting with the Sugar Man. Surprised and intrigued by the polite request, the evil geneticist agreed and sent them instructions to reach his hidden, underground lair. (Magneto III#19) - When Magneto and Briar arrived, the Sugar Man listened to what the mutant master of magnetism needed, somewhat pleased that Magnus had sought him out considering there were more capable geneticists out there and the fact he'd recently been killing mutantkind's enemies like him. Magneto explained that the world would soon be coming to an end (because of the incursions) and that he needed someone who could offer a quick and dirty solution to his lack of power. Sugar Man thought it over, then offered up the schematics for mobile power amplifiers he had been tinkering with in his spare time. While Magneto was studying the plans, Sugar Man casually noted he was glad that Magnus had given up "that nasty, murderous vigilante business". Looking up from the plans, Magneto calmly asked "who said I had abandoned my mission?" before skewering the Earth-295 native with stray metal objects, seemingly killing him. He explained to his ally Briar that Sugar Man was a blight against mutantkind he no longer had use for. The world would be better off without his ilk (see comments). Sugar Man's death at the hands of Magneto might not be as final as it seems. After all, he was pretty much ripped apart and left for dead back in Generation Next I#4, only to show up alive and well a little while later. Sugar Man's appearances in the 2012/2013 Age of Apocalyse series are a bit confusing, because it's never established how he actually escaped SHIELD custody on Earth-616 to return home. Considering most of his appearances from the late 90s on revolve around him trying to find a way back to Earth-295, it's a glaring omission. Same with how he found his way back to Earth-616 (and why!) at the end of the AoA ongoing. No mention was made of the changes Penance made to his mind as well, which would lead one to conclude this Sugar Man was actually a clone cooked up by Dark Beast to assist him in reviving the deceased mutants. When asked, AoA author David Lapham dismissed the clone theory: "He's already an alternate universe character it seems very complicated to have him be a clone, too, no? I prefer to think he found his way home somehow in an untold story, BUT I'm certainly no official word on that subject." So noted. Sugar Man had a follower called Rex during his tenure as Genosha's puppet master. 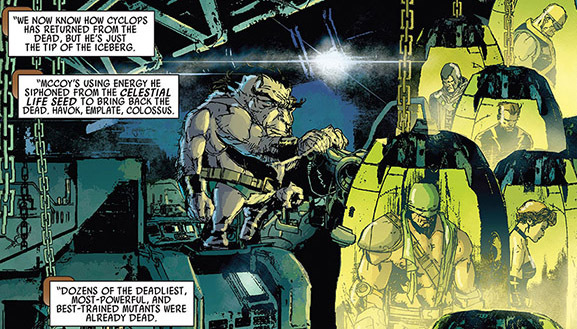 Earth-295's Apocalypse's right hand man was also called Rex and bore a certain similarity to the 616 version. He might have been a clone, created by Sugar Man to make himself feel more at home in this world. That seems to fit if you consider the 616-Rex looked about 20 years older than his Earth-295 counterpart. What Sugar Man wanted with Philip Moreau has not been revealed. Moreau got abducted by Sugar Man at the end of 1996's Cable II#28, only to show up alive and well as part of Magneto's cabinet in the early 2000s Magneto miniseries. Sugar Man's co-creator Scott Lobdell was kind enough to answer a few questions about the character and his origins: "The idea behind Sugar Man was to create some Age of Apocalypse mutants who did not have any corollaries in our world. As much fun as it was to use variants of Sabretooth et al, I thought it would get boring if every single person we met was just a new take on an old character. Hence Sugar Man and Vincente and a few others. As for his name, I knew I wanted something scary and disturbing that sounded like Boogey Man -- because the story was told from the POV of the kids, if I recall. If I recall this correctly, I am pretty sure I came up with the title "The Sugar Man Cometh" and then Chris Bachalo turned in these great sketches and I was like "Yep, that is exactly what a Sugar Man who runs a concentration camp would look like!" 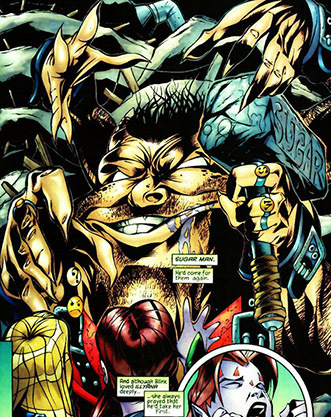 Sugar Man was only one of four Earth-295 natives to initially survive into "regular" Earth-616 continuity. Lobdell explained his reasoning behind bringing Sugar Man along for the ride: "In part because there was no Sugar Man on our world (at the time). It is sort of like when a serial killer disappears after a spate of murders and the authorities are left to wonder if he was hit by a car or got arrested on another crime or something. I thought it was really interesting -- this guy who was like the evil of the evilest didn't make his mark on our world. Did something happen to him when he was younger here? Did he die? Is he a mutant who can change shape and maybe his manifestation never happened on our world? I still love the notion that we would meet our Sugar Man and he would be the nicest guy in the world. How disturbing would it be to know there was a version of you possibly living inside of you capable of creating and running a concentration camp and experimenting on people? So many interesting angles to explore." Lobdell also added that turning him into an evil geneticist responsible for the mutates on Genosha was never his idea: " I'm not trying to shake off responsibility for a bad decision, but I'm pretty sure I didn't write those appearances. I'm guessing that is the case because there are some ideas I just never liked in the X-Verse: Genosha being one of those. ("An island of mutant slaves!" Um, like what? A mutant butler? A mutant chef?") Also the notion that it seems unlikely these people who are by their very creation super powered being enslaved en masse sounded crazy silly to me. Like, the amount of technology needed to keep this mutant population enslaved in order to get their shirts ironed never seemed cost effective to me. So it is unlikely I would have put him there." For the record, Sugar Man's Genoshan ties were established by Warren Ellis and fully fleshed out by Jeph Loeb. 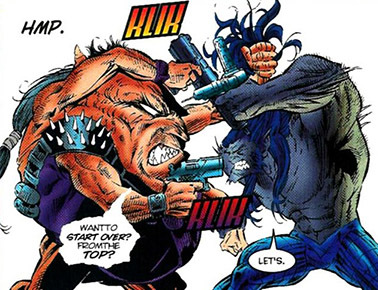 During their brief fight in the Lobdell penned X-Men II#48, Dark Beast calls Sugar Man a "gene joke", which is a racist slur for anyone non-mutant. When asked about it, Scott confirmed that the Sugar Man was most definitely a mutant: "Back in Uncanny X-Men I#298, the Acolytes tried to recruit a young mutant called Teddy, but all their philosophy about mutants being the superior race gets held up as hypocritical when they abandon the young mutant because he has Down Syndrome. He wasn't the "right kind of mutant" worth enlisting in their cause. Similarly, I think I liked the idea that Dark Beast looked at Sugar Man as less than a mutant because he was so horrific and vile a creature. He was not the Aryan-version of a mutant that Dark Beast was looking to create." Sugar Man received profiles in Official Handbook of the Marvel Universe: X-Men Age of Apocalypse (2005), Dark Reign Files#1 (2009), Official Handbook of the Marvel Universe HC#11 (2010) and Heroic Age: X-Men#1 (2011).